Hello boys and girls! I’m Dr Kanra Khan (not yet, wait three more years) and today we’re going to be going over something that seems to fascinate the youth of today. Are you thinking what I’m thinking? Yes, that’s right. All those wonderful comments that people leave on the internet, just three letters, really. Are we on the same wavelength yet? KYS. An acronym for “kill yourself”, KYS is like.. well. It’s really bad okay. You should never go around telling random people on the internet to kill themselves. That’s never nice. Although if you really want to kill someone in that passive aggressive way, it’s not that bad an option at all. What makes this series better than a random google search done before brashly stabbing your friend in the back for metaphorically stabbing you in the back? Well, for one thing, it’s me running the show, not google (yes hello, I am your favorite doctor, okay?) so that means I’m going to be super nice to you and help you out a lot! Secondly, I’m going to be working backwards with you. That’s right. We’re going to be working backwards. We’ll be constructing the crime from the very end of it and working our way to the starting point. It’ll help you evade the law more easily, especially since we’ll be talking in the context of forensic medicine. Crime usually involves injury. In forensic medicine, injury is defined as “any harm caused to any person in body, mind, reputation or property“. By this definition, a lot of things fall under injury, like punching someone, pushing them into depression, spreading maligning rumors about them or stealing something that belongs to them. That’s all some pretty bad stuff, but you have to admit, straight up killing someone or being involved in their death is some really dirty business. I think the worst part about it would be that the damage is completely irreversible; you can’t bring the dead back to life and you can’t ask a corpse for forgiveness. You can’t make up for it to them. 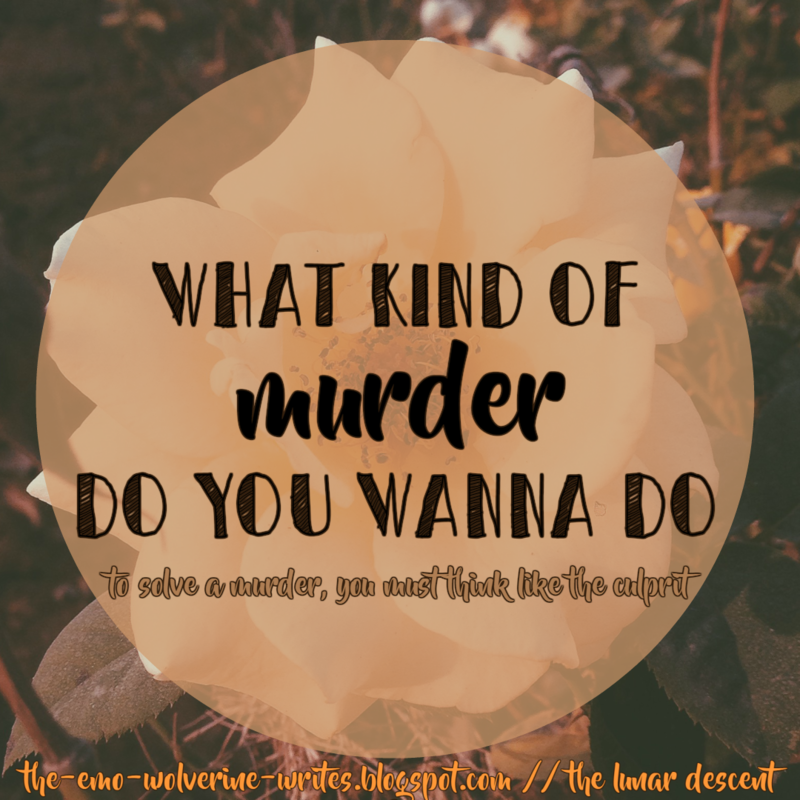 You could turn over a new leaf, but murder? That’s not so easy to scrub off. Alright. Let’s start constructing our crime by working backwards. We have here, a person, named… Let’s name them something gender neutral, like Jo. I like Jo. Jo could be for John or Josephine. Doesn’t matter. So, Jo here has been murdered- hypothetically, by us. You and I. Where is the last place Jo would be before being laid to rest? In the morgue. On an examination table. There’s our medical examiner- a forensic pathologist. Again, hypothetical pal of ours. Let’s name them… Dr Frankie. Frankie Stein. Perfect. Alright, so Dr Frankie is going to examine Jo. There’s lots of things for Dr Frankie to look for, because the mode of death will leave hints on Jo’s body. For example, if we (you and I), decide to kill Jo by strangling them, Jo’s neck will have related signs, whether it’s the imprint of a rope or the imprint of hands. Similarly, other acts of violence will also be visible on Jo’s body. It’s Dr Frankie’s job to decide on what kind of death Jo died. There are four categories that Jo can fall in to. 1. Natural Death. Maybe nothing happened to Jo at all. Maybe we let Jo live their life to the very end. Jo could have been a diabetic or a heart patient. Jo could have been very elderly. It’s very possible that Jo got very ill and died. A natural death basically means that there hasn’t been any outside intervention in causing Jo’s death. There has been no foul play. 2. Homicide. Also known as murder. It could be that Jo has a stab wound on their back, or a gun shot in the chest. Maybe if Dr Frankie cut Jo open and found something interesting, they could also conclude poisoning. 3. Accidental Death. Ooh, this category is tricky. Accidental death can be of two types. It could be that Jo died because they forgot to unplug the hair dryer and electrocuted themselves to death. Or maybe someone accidentally pushed Jo onto train tracks on a busy Monday morning. It’s the second type of ‘accidental’ death which is tricky to deal with! After all, how can you decide what the actual intentions of the culprit were? 4. Suicide. Maybe Jo had a rough day at work and hung themselves, or decided to overdose on pills. Either way, such a death would have minimal struggle as opposed to a homicidal death, where Jo has a chance to fight. There can be other clues that can make the conclusion tricky- maybe Jo had second thoughts and did decide to fight death, having changed their minds at the last minute. While it’s important to thoroughly examine the body for clues, it’s also important to look at circumstantial evidence. You might think circumstantial evidence is just the crime scene, but it also includes things like the daily routine of Jo. It would easy to pin a diagnosis of suicide on Jo if they had a suicide note, a recently dumped job and a couple of unpaid bills. However, if Jo’s house looks vandalized, with evidence that someone else was there as well, despite Jo being an unsocial person, it would be pretty hard to stamp ‘suicide’ and move on. The point? For a perfect crime, we’re going to need to select the right kind of person. We’re going to need to set up the right kind of crime scene. We’re going to need to construct the perfect story so no one ever guesses it’s us! Homicidal deaths could be disguised into natural deaths or suicidal deaths or accidental deaths. It’s Dr Frankie’s job to uncover that disguise and apprehend us. But this is all hypothetical, you know? I hope you’re not actually thinking up of possible ways to get away with homicide. What did poor Jo ever do to you? Oh yes, you’re right. This is hypothetical. Jo could have done anything, Jo could be anything. Maybe Joe is a criminal, or a corrupt politician. We might have done our hypothetical world a favor by knocking Jo out but that doesn’t excuse Dr Frankie from trying to catch us before we strike again!